Our kids are pretty practiced cyclists and this allowed us to take on a couple of significant day trips here in the Netherlands. The first was Amsterdam. I was worried about this one because Amsterdam is a very busy cycling city and you need to be relaxed and bold at the same time (historically, I am neither of these things). Our kids are capable of dealing with these conditions but, as they are only 6 and 9 years of age, they still rely on us to know what is safe at any given time. To help me feel more relaxed, we avoided Amsterdam Centraal and stopped at Amsterdam South (train station). It is much less busy and requires a quick 15 minute walk before entering Amsterdam’s famous Vondelpark. The only trouble is that bike rental stations are all on the side of the park closest the centre. We enjoyed the stroll through the park anyway and had our bikes from Macbike in no time. They are supposedly the only place that reliably has bikes for young kids. The cycle through the park was easy and relaxing. We left the park and started on a loop that would eventually bring us through the centre. We spent a lot of time on local streets and in non-separated bike lanes. I was hoping for a more brainless cycle…instead we needed to be very aware of traffic and crossings. We did well and it was still nice to take in the city, but I felt we needed to push the kids to think and look for themselves to a greater extent than normal for us. If they weren’t right beside us for several crossings, they were not safe crossing a couple seconds behind us. It was simply too busy. The next day we took on the 23 km cycle (46 round trip) from Rotterdam to Kinderdijk. . We experienced a mixture of separated and non-separated bike lanes plus several stretches of local roads with only light traffic. It was a very pleasant cycle, and made good use of all of the practice the boys have had back home. Both boys were able to complete both halves of the journey without stopping or complaining. It was an awesome day as a result. 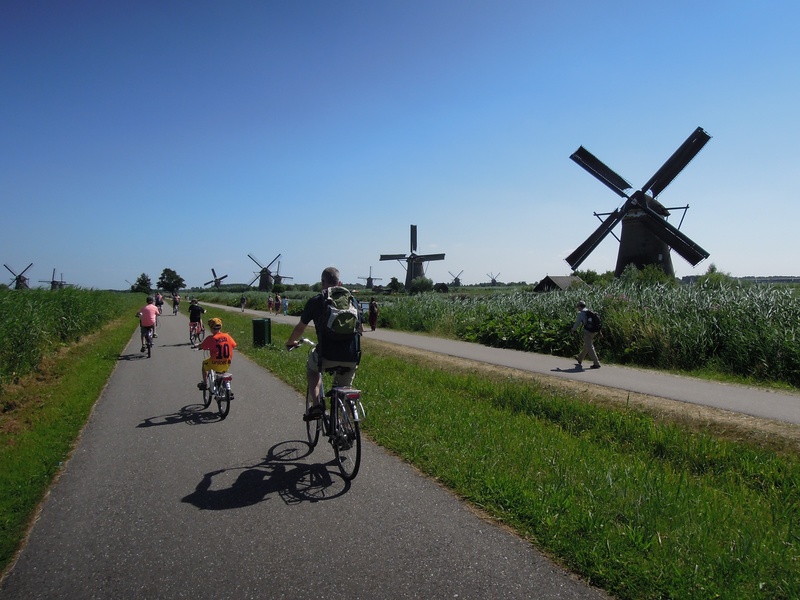 There is no better way to approach the famous Kinderdijk windmills than by bike. (Plus you need to take a special bike ferry to access the park, which is pretty cool). And what a great park! It is free to enter unless you want to go inside one of the working windmills (and we did, of course). We were shocked at the power of those things! We never expected to find them so fascinating. The kids took a bunch of videos of the working parts and patiently explored all of the rooms. The nice thing was that there were only a handful of other people checking them out. No lines! 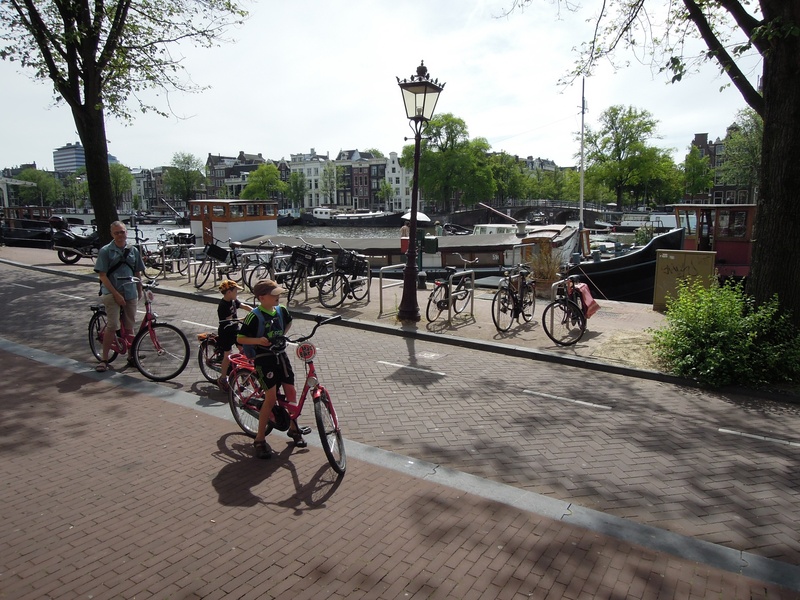 We cycled a short distance into the park and enjoyed watching local children swimming and fishing in the canals. Then we made our way back to Rotterdam, ate some well-earned dinner, and caught the train back to Den Bosch (highspeed and regular commuter trains). A pretty classic Holland experience all the way. Via Google I found this page, and more specific, the photo made at Kinderdijk. Is it possible for me to use this photo as a background in a summer-flyer for the Dutch Union CNV Vakmensen? No problem. Sorry it took me a while to respond.